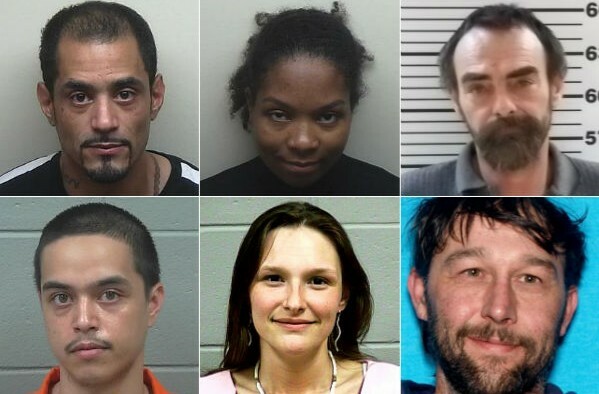 From top left, clockwise: Marc Atwater, Cydnee Atwater, George Pickard, Christopher Abbott, April Abbott and Joseph Steele. Two Florida residents are among five people facing charges after being arrested this week as part of an investigation into an alleged drug trafficking ring in Hancock County, according to the Maine Drug Enforcement Agency. Three young children in a car that was stopped by police as part of the investigation were taken into custody by state officials, Maine Department of Public Safety Spokesman Stephen McCausland said Friday in a prepared statement. The children, whose ages and names were not released, were in a Mercedes sedan with Sanford, Florida, residents Marc Atwater, 37, and Cydnee Atwater, 33, when police stopped the vehicle on Route 1A in Dedham on Thursday. The Atwaters were arrested on charges of aggravated trafficking in scheduled drugs after police recovered more than 125 grams of cocaine that was hidden inside Cydnee Atwater’s body, McCausland wrote. The Atwaters each were being held Friday at Hancock County Jail in Ellsworth on $200,000 bail. Also arrested separately this past week in Franklin as part of the investigation were local residents George Pickard, 57, and Christopher Abbott, 42. Christopher Abbott and Pickard each are accused of selling drugs in a transaction monitored by MDEA. April Abbott, 37, was found to be in possession of heroin during a traffic stop and was arrested at the same time as her husband, McCausland said. As part of the same investigation into sales of cocaine and heroin in the Franklin area, a sixth person was arrested in April. In that arrest, Joseph Steele, 29, of Pawtucket, Rhode Island, was driving north on I-95 in Newport when police stopped him and found 57 grams of crack cocaine and 30 grams of heroin in his vehicle, according to McCausland. More arrests are possible as the investigation continues, he added.